In the months since Summer has ended, I have been getting asked more and more about how gym members can motivate themselves; or find the motivation they once had. A lot of my own personal training clients know that on the days that they don’t see me, I expect to see them at the gym doing the homework I assigned them or taking a group fitness class. Belonging to a gym that offers tons of group fitness classes per week is a great perk that all gym members have access to. I am as disciplined as they come and even I struggle some days. These are the days that I turn to group fitness classes for motivation. I know that the hardest part is just getting in the door. If the group fitness instructor sees me, I know I am now going to be held accountable and I can’t just sneak out of the room. When I look around and see the other gym members, I instantly feel motivated. If they are in there and ready to work, I need to be too. There is something about working out in the presence of others that subconsciously pushes us further than we would push ourselves. Another great benefit is the fact that I get to meet new people and socialize with people other than just fellow trainers and gym staff. I meet a lot of gym members and it makes me feel like I truly have my own little gym family. For those who are just starting out with the gym and feel uncomfortable around weights or with form, group fitness classes are a great way to learn proper form and technique without feeling singled out. That way, when you go to work out on your own on all the top notch equipment you’ve feared up until now, you will have no problems now that you know exactly what you’re supposed to do. 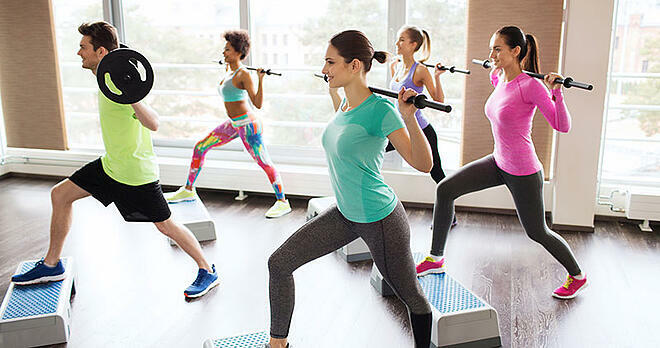 Attending group fitness classes will instantly add routine & structure to your gym routine. Instead of telling a friend, “oh, I’m going to go to the gym at some point today”, you can take a look at the class schedule ahead of time and say, “I’m going to BodyPump at 530pm today”. You can go on with your day as planned but now you know exactly what class you’re taking and the exact time it will start. No excuses! And who’s to say we have to limit it to one type of class? I have taken cardio classes, spinning, weight training, TRX, yoga, you name it. There is a class for everyone. I like to try each class at least once. When I find the one I like (or the one I know I need), I make sure I plan my schedule around that class. Check out Explosive Performance Athlete Training for ALL LEVELS! OR Check out ZONE4Group Training! It't the Ultimate Workout!